In the popular idol drama In Time with You (I May Not Love You), Cheng You Qing circles between two lead actors Ding Li Wei (played by Sunny Wang) and Li Da Ren (played by Bo-Lin Chen), letting viewers immerse into the drama. In Time with You set to wrap up soon in 3 more episodes, but many viewers who immerse into the drama not only entangled by the complex emotions of the characters in the drama, but some cannot wait and have bought the book of original screenplay to get the first glimpse into the ending. 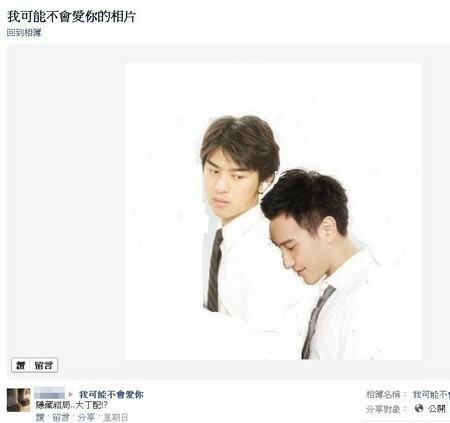 And there was even the Facebook fan of In Time with You who had posted a synthesis spoof “Love of Da Ding” (Li Dan Ren and Ding Li Wei) grand final photo. In the photo, Ding Liwei shows his small male flirtatious expressions, tenderly and shyly put his head on the shoulder of Li Daren, and Li Da Ren is also look back fondly, conveying a high ambiguous feelings between the two men. Netizens are giving enthusiastic responses, said, “This is the ending I want”, “Very matching!” And there are many viewers who furious about Cheng You Qing who does not understand the good of Li Da Ren, were praising the photo is simply too great. Although the viewership rating of In Time with You is still less than Office Girls, but the intensity of the discussion is quite high. Last episode, there was a scene where the leading roles are singing Mavis Fan’s Oxygen (氧氣) in the KTV, the responses expectedly the Facebook’s discussion area to down, thus it can be seen how fascinating is In Time with You.